New York AM Radio LLC (WEPN-FM) (hereinafter collectively referred to as "Sponsor") 125 West End Avenue, New York, NY 10023. Only open to legal U.S. residents, who are 18 years of age or older as of entry and reside in the WEPN-FM radio station's listening area, which covers the New York City tri-state area (NY, NJ and CT), except where prohibited by law. Any individuals (including but not limited to employees, consultants, independent contractors, and interns) who have, within the past six months, performed services for Sponsor, any organizations responsible for sponsoring, fulfilling, administering, advertising or promoting the Promotion or supplying the prize, and their respective parent, subsidiary, affiliated and successor companies, and immediate family and household members of such individuals, are not eligible to enter or play. "Immediate family members" shall mean parents, step-parents, children, step-children, siblings, step-siblings, or spouses. "Household members" shall mean people who share the same residence at least three months a year. Any individuals who have won a prize in a contest or sweepstakes conducted by Sponsor within thirty (30) days of entry are not eligible to enter this Promotion. The 98.7 FM Bash for Cash Promotion (the "Promotion") begins on or about March 28, 2018 at 10:00 AM Eastern Time ("ET") and ends on September 29, 2019 at 3:00 PM ET (the "Promotion Period"). 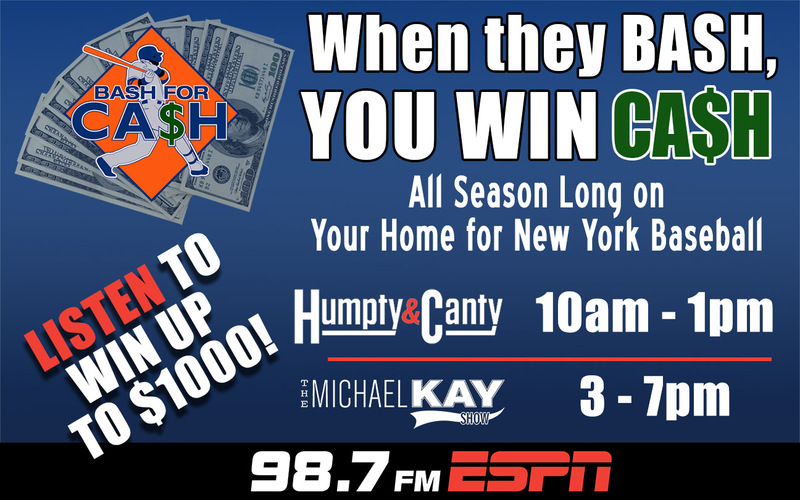 During the Promotion Period, eligible entrants should listen to The Humpty & Canty Show ("H&C") (weekdays between 10 AM ET and 1 PM ET), The Michael Kay Show ("TMKS") (weekdays between 3 PM ET and 6 PM ET), or Weekend shows ( Saturday & Sunday between 10 AM ET and 7 PM ET) for a "cue to call" 1-800-919-3776 ("Number") for the Bash for Cash Promotion announcement ("Announcement"), and be ready to provide a prediction for (a) the name of a player who will hit a home run and (b) the inning in which the home run will occur during the next New York American League or New York National League Baseball Club game (collectively "Predictions"). Predictions must be for New York American League Baseball Club or New York National League Baseball Club players only. Predictions for New York American League & National League Baseball Clubs & weekday day games (12 PM ET to 3 PM ET start times) must be made Monday through Friday between 10 AM ET and 1 PM ET before that days game during the Promotion Period. Predictions for New York American League & National League Baseball Clubs & weekday evening games (4 PM ET or later start times) must be made Monday through Friday between 3 PM ET and 6 PM ET before that evening's game during the Promotion Period. Predictions for New York American League & National League Baseball Club & weekend games (10 AM ET or later start times) must be made Saturday or Sunday between 10 AM ET and 7 PM ET before that day's game during the Promotion Period. The first eligible caller to reach H&C, TMKS, or Weekend shows at the Number after the Announcement ("Daily Qualifier") will be awarded a $50 P.C. Richard and Son gift card and may make Predictions for the next New York American League or New York National League Baseball Club game. The Daily Qualifier must provide an email and phone number to be used by Sponsor to contact Daily Qualifier for Predictions for the next New York American League or New York National League Baseball Club game in the event a game is rained out or postponed and for cash prize notification if either of Daily Qualifier's Predictions are correct. A Daily Qualifier will be picked every weekday or weekend prior to a New York American League or New York National League Baseball Club day game (10 AM ET - 3 PM ET), evening game (4 PM ET or later start time) & weekend game (10 AM ET or later start time). If a New York American League or New York National League Baseball Club game is rained out or postponed following the selection of a Daily Qualifier, Daily Qualifier will be eligible to make Predictions for the next available New York American League or New York National League Baseball club game that does not have a previously selected Daily Qualifier. If a New York American League or New York National League Baseball Club game is rained out or postponed prior to selection of a Daily Qualifier, a Daily Qualifier will be selected if and when Major League Baseball reschedules that New York American League or New York National League Baseball Club game. All games are official under Major League Baseball rules. If no winner is determined by the end of the New York American League or New York National League Baseball Club game, or if potential winner(s) are found to be ineligible or otherwise not in compliance with these Official Rules, no prize will be awarded for that New York American League or New York National League Baseball Club game and potential winners will be disqualified without compensation of any kind. No more than the stated number of prizes will be awarded. If New York American League or New York National League Baseball Club games are cancelled, Sponsor at its own discretion, may elect to hold a random drawing from among all eligible entries received up to the date of discontinuance for any or all of the gift card prizes offered herein. Limit (1) prize per household each month during Promotion Period. Odds of winning a prize depends on total number of eligible entries received during the Promotion Period. Only calls to the specified Number are eligible. Sponsor is not responsible for inability of caller to complete call within specified time, whether due to busy lines, disconnections, telephone malfunctions or other circumstances. After a Daily Qualifier has given their Predictions, Sponsor will compare the Predictions to the events of the New York American League or New York National League Baseball Club game. If Daily Qualifier correctly predicts the name of a player from the New York American League or New York National League Baseball Club who hits a home run, the Daily Qualifier will be eligible for a $100 cash prize and will be a potential daily winner ("Daily Winner"). 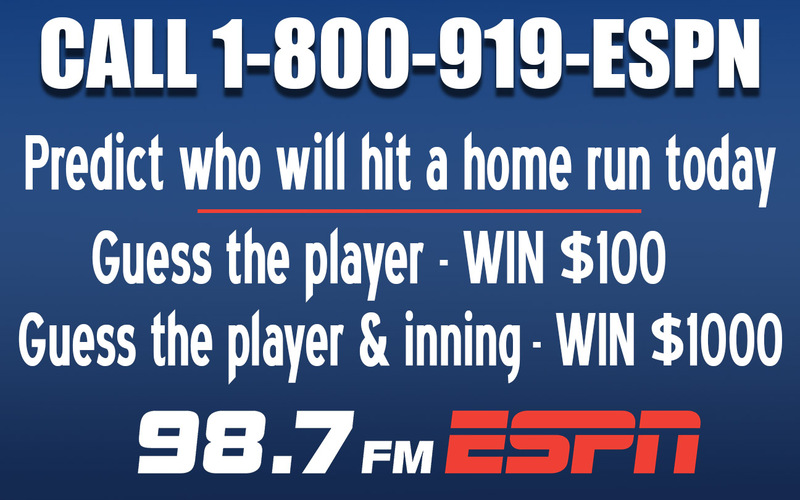 If the selected player also hits the home run in the predicted inning, the Daily Qualifier will be eligible for an additional $900 cash prize, totaling $1000.00 in cash prizes. On or about the morning (Monday through Friday) following a New York American League or New York National League Baseball Club game, Daily Qualifier will be notified at the phone number and/or email provided at the time of qualification of the outcome of their Predictions and if they are a potential Daily Winner. The outcome of the Predictions and any cash winnings may also be announced on air during H&C, TMKS, or Weekend Shows. Potential Daily Winner must respond to notice within forty-eight (48) hours or cash prize will be forfeited. Failure to timely comply with any requirement of these terms and conditions will result in potential Daily Winner being deemed ineligible for any prize. If the Daily Qualifier does not correctly predict the name of a player hitting a home run, the inning in which the home run occurred, or if potential Daily Winner is found to be ineligible or otherwise not in compliance with these Official Rules, no cash prize will be awarded that day and potential Daily Winner will be disqualified without compensation of any kind. No more than the stated number of prizes will be awarded. Final determination of winners is always conditional on verification of eligibility and compliance with the Official Rules. Up to one hundred Seventy-Four (174) prizes are available to be won. Each eligible Daily Qualifier will receive a $50 P.C. Richard & Son gift card. Daily Winners who correctly predict the name of a player that hits a home run in the next New York American League or New York National League Baseball Club game will be awarded $100; and, if they also predict the correct inning in which the selected player hits the home run, they will be awarded an additional $900 cash prize, totaling $1000.00 in cash prizes.. Cash prizes will be awarded in the form of a check. Approximate retail value ("ARV") of each prize: $50 to $1050. Under no circumstances will total ARV of all prizes exceed $182,700.00. All expenses not specifically provided for herein are the sole responsibility of each prize winner. Some restrictions may apply. The prize winners shall be solely responsible for any applicable federal, state, provincial, local taxes and/or local laws and regulations, and the reporting consequences thereof, and for any other fees or costs associated with the prizes. Winners will receive an IRS Form 1099 reflecting the final actual value of any prize valued at $600 or more and must submit a validly executed IRS Form W-9 to claim a prize. By participating, entrants agree to be bound by these Official Rules and the decisions of Sponsor, which shall be final in all respects. By participating in this Promotion and/or accepting any prize that they may win, entrants agree to release Sponsor, H&C, TMKS, their parent, subsidiary, affiliated and successor companies, advertising and promotion agencies and prize suppliers, and each of their respective officers, directors, agents, representatives and employees, as well as each of their respective successors, representatives and assigns, (collectively, the "Released Parties") from any and all actions, claims, injury, loss or damage arising in any manner, directly or indirectly, from participation in the Promotion and/or acceptance or use of the prize. To claim prize, winner must: (a) provide proof of winner's age, residency, and legal status; (b) sign and return eligibility, publicity, liability, rules compliance and any other releases requested by Sponsor; all within the time period(s) specified by Sponsor. Sponsor reserves the right, in its sole discretion, to disqualify any individual who tampers with the entry process and to cancel, terminate, modify and/or suspend the Promotion in the event of tampering or other circumstances, including but not limited to acts of God or civil disturbance that render it impractical or impossible to complete or fulfill the Promotion as originally planned. These rules will be posted on http://espnnewyork.com/radio for at least thirty (30) days after winners are finally determined. For a list of winners, send a self-addressed, stamped envelope to New York AM Radio LLC (WEPN-FM), 98.7 FM Bash for Cash, 125 West End Avenue, New York, NY 10023 within sixty (60) days after Promotion end date.